"People who are successful take action and have always done something worthwhile; for which they will be ever remembered." He sailed into the spiritual world on the 16th of may 1995, mingling himself with the holy as hat is where he belonged. People come and people go but it is persons like Shri. Darbari Lal Ji who leave behind such a void. We the D.A.V. Pusphajanli family pay our humble and respectful homage to his saintly, Personality and promise to take his aspiration forward on the path of success. He will be ever remembered for all the actions he took and the worthwhile work he did. Indeed, the name of the game is patience. It is a team work, dedicated towards a target, resulting in achievement, D.A.V. 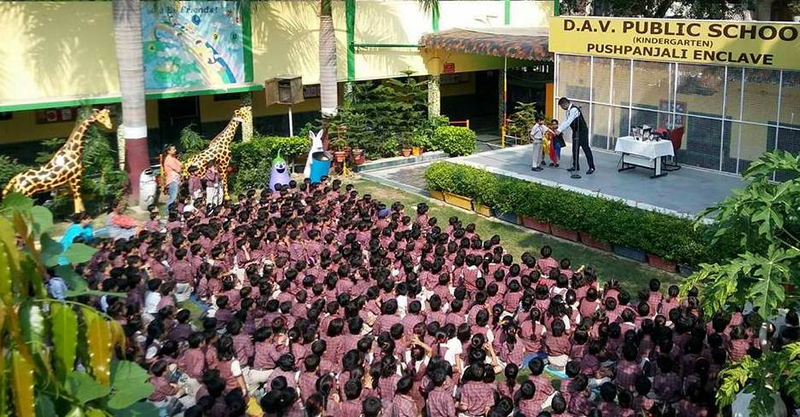 Public School, Pushpanjali the very name conjures up the vision of an institution dedicated to realize Vivekanand's ideal. It is an institution whose students are encouraged not only to give the right answers but also to ask the right questions, a place where students are not only made to learn their lessons but also made to unlearn their prejudices. 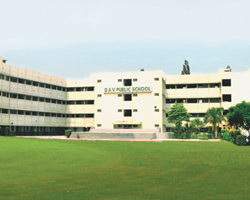 The School came into existence in 1989 and over the period of twenty four years of commendable service. It has now entered the SILVER JUBILEE YEAR. It today stands out as one of the best institutions of the area. It seamlessly blends academic pursuits with personality development. It is a priceless combination that is a boon for the students. The School spread over an area of 4 acres, with a separate kindergarten wing, aims at excellence in all fields and extracurricular activities. Our success in the C.B.S.E. Board Exams over the past years is a proud but humble example of our achievements. The school boasts of a sound infrastructure and a sound team of teachers both ensuring to bring out the best in each. For us “Success is a journey not a destination” and we continue to strive for betterment. D.A.V. Pushpanjali has progressed and is ever progressing and rendering a great service in all spheres namely, academic, cultural and sports. It is expanding, establishing and covering new horizons in various fields year after year. It is setting new standards of achievement and leaving an indelible impression on the minds of everyone through various orientation programmes. Now, it has already entered a new era of Globalisation with a heightened sense of responsibility which it has been entrusted with to create and achieve a rare phenomenal atmosphere of mutual understanding between the teachers and the taught that is conducive for the all round development of the students and builds a rare sense of belonging in the students for their institution, that is very fruitful. 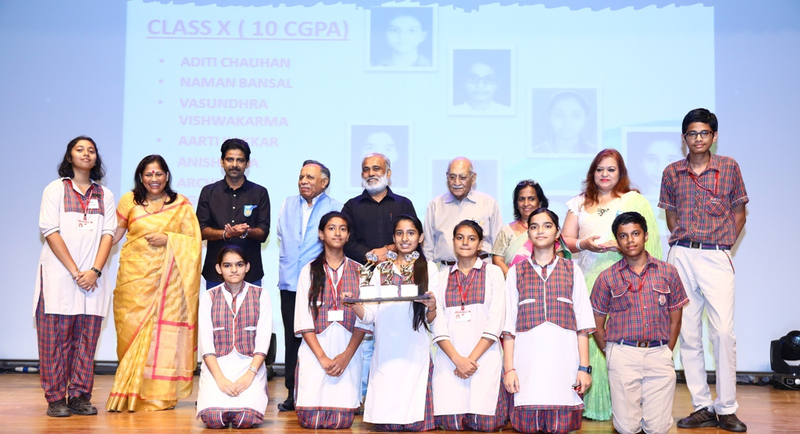 It looks back in all earnestness to assess the previous efforts, to improve and scale new heights and bear even more fruitful results in all spheres in the future, as well as to make all efforts and ventures of the school a success. What I do know; it is now time, to unroll and review the scroll of life, and with rejuvenated energy keep striding ahead into the future with new goals and objectives. To read, interpret and rearrange some worthy fruits of effort and age. Academic Incentives/Encouragement given to the students. The meritorious students of each class will be awarded maroon blazer, blue blazer & green blazer according to the performance in academics/ Board examination (Detailed information regarding the criteria will be informed later). Highest score in each subject in Board examinations. Will be awarded in different categories. Adjudged by a panel of judges. c). Student should have outstanding record in academics, sports and co-curricular activities,including moral values and manners. a). Student should have studied in the school since class VI. b). Adjudged at the discretion of the Principal. Note: A Student who has been issued any card for misconduct is not entitled to get any scholarship. The school was established in January 1989 with 400 students on roll and 20 staff members teaching and non teaching) to begin with. In a short span of time it made a quantum leap and made a phenomenal progress. At the ripe young age of 24 the strength has reached the toll of 4,000 students and 200 staff members teaching and non teaching). The School has traversed a long eventful journey and has entered into the 25th year or the Silver Jubilee Year since, its inception. Desire, Motivation, Determination and Commitment to an unrelenting pursuit of our goal - a commitment to excellence has enabled us to attain the success we sought. The school now boasts of a sound and well developed infrastructure with 90 spacious and well ventilated classrooms that have been transformed into e-pathshalas equipped with Digital Smart Boards, the state of art laboratories for Physics, Chemistry, Biology, Mathematics, Geography, Psychology, JIL labs, Computer Lab on each floor, Conference room for meetings and seminars and a Computerized Library. 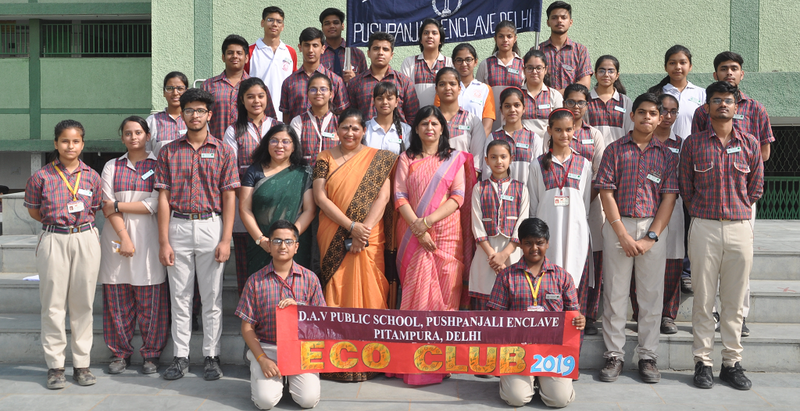 The school believes in setting clear visions and challenges for laying a healthy foundation by creating a sustainable environment, that is the key to human existence. Our students ponder, probe, train, exert to bring about a wonderful alignment of all the faculties for a distinctive and qualitative achievement, to realize the individuality and uniqueness without compromising the human touch, refinement of the heart and discipline of the spirit. The school has become an institution to be reckoned with. It has not only carved a niche for itself but also enjoys great renown of its own. It has forcefully arrived and is here to stay. The excellent results each year, at every level speak for themselves. We can proudly say that the school has blended the modern with the moral and ethical successfully and has maintained the highest character all through. This in itself is a great achievement. It is a new beginning for us today and we have to move past what we are now, innovatively with a new clarity, goals and commitment. Success for us is not a destination; it's a never ending journey.